After finishing "Gugure! Kokkuri-san" I had to think to myself: What makes an anime good? Is it the person's expectations going in? Because I came for the comedy and at no point throughout the entirety of the show was I ever disappointed. In fact, comedy is the only thing that this show even makes an attempt at, and boy does it do it well (although there is a recurring message in the show if you can pick it out). I'll try my best to tell you my thoughts on the show, and if you hate the very core of my being after this review than I'm sure we can talk it out like civilized people. I'm starting with characters because to be honest... If you don't like the characters you will not enjoy the show. Kokkuri himself is portrayed as an attractive spirit struggling with a mid-life crisis due to him fearing for his relevance in the the modern world. Although he's a man he has many intricacies that one would normally associate with women. This takes form (literally) later on in the show. Now Kohina can be a really hit or miss character with some people. Her design is extremely deformed in comparison to all of the other characters (which turns a lot of people off), but anyone who is familiar with "Oyasumi Punpun" should have at least some idea of whats really going on there. She is the center of all insanity that happens in each episode. Shigaraki was probably my favorite character although he started out as my least favorite. Another spirit who often brings misfortune to others, but despite this he is a true romantic. Inugami is yandere dog who died from neglect but was reincarnated into the world as a spirit. He/she gender swaps often due forgetting his/her gender in the previous life. Characters interactions were entertaining throughout. The opening is cleverly done, full of personality, and of course catchy as hell. The ending is good as well, and the shows OST is funny sounding... in the best way possible. As for the art I'd say its completely average. I mean sure it has a certain style to it, but in comparison to many other shows released this year there really is nothing notable about it. From the first 2 episodes you will know whether this show is for you or not. The series seems to enjoy taunting its viewers with scenarios that in many other shows would be clear indicators of: DRAMA INCOMING! only to slap you along with your expectations across the face. This happens a lot. But its FUNNY EVERY TIME. Although I'd be lying if I said I didn't want to see some drama play out. Either way the synopsis pretty much says it all, and the way the story presents itself is favorable. Conclusion- If you want some laughs look no further! This is your show! If you want anything else... Its a questionable endeavor. I gave it a great 8 because not many shows can make me laugh as much as this one did. -If Satire/parody is your thing, because this show has every western/Japanese pop culture gag you can think of. -Had a rough day? Just sit back and laugh it off! -Fun Characters that will grow on you. -If you want some sort of meaningful romance/drama. Gugure Kokkuri-San has come to an end. Another ending which make me feel ugh, what to watch again. Honestly this is the funniest anime to watch in 2014. This reminds me of barakemon and Gekkan Shoujo Nozaki Kun, those two anime shows were really great. I really like the voice actors typically Daisuke Ono, who voice of course Kokkuri and Sensei from Barakemon. Art: 8/10, I have no comments on this, but good job on Kokkuri-San especially when she's a girl. Sound:9/10, The OP song was really catchy, I couldn't bear to skip it. The ED song to was really touching, that feel, you know. Lastly enjoyment : 10/10, I say this is really a good anime to watch though it has mix plots and weird stuffs, but it's a good time to watch after doing some stressing works, yeah. This was a good anime to watch and I rank 2nd after Amagi brilliant park for this. I totally RECOMMEND all of you to watch this anime, not Amagi of course. I hear there's a special 5mins episode for this, hope it will be funnier! And hopefully there will be 2nd season, IF. 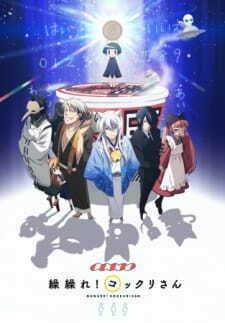 Amusing, funny, and full of heartwarming moments, Gugure! Kokkuri-San managed to captivate me with it's unique charm and cast of characters. There were too many things I liked about this show so I'll try and keep it short and sweet, just like Kohina. Perhaps the best thing I loved most was the characters. Ordinarily, I like unique Anime shows, that offer a large to Medium variety of characters. However, Gugure! Kokkuri-San has such a small amount of characters and I just loved them. The characters of the show are obviously from Japanese mythology and games. These spirits that are supposed to be terrifying all have such the personalities and characteristic traits given to them that were just so hilarious. Their jokes, slapstick, relationships (how they got along) and gags were something that I really enjoyed seeing. The story is there, however it is more like you're just watching the daily lives of a little girl who thinks she's a doll interact and live with 3 spirits. One thing that bothered me just a little was that there was no real backstory. Kokkuri mentions a few times during the show about how he's been aware and has seen Kohina in the past before being summoned to her, however nothing else is explained. Which really makes me question what was the point of adding that into the show if there wasn't going to be any explanation. The artwork and character designs done for the show were varied in my opinion. Some were good some were bad, other moments I just didn't care too much. The soundtrack isn't that bad either, the opening song can be a bit of an ear-worm at times, and the ending song was pretty decent, I liked how the characters would change every few episodes. My final thoughts are that I would highly recommend this show to anyone, especially if you just want to laugh and be entertained without having to think too much. Overall rating is 8/10 for being a very good and refreshing comedy while representing the unique side of anime. Lastly, Gugure! Kokkuri-San did a pretty damn good job at adding a unique spin and take on Japanese Mythology. Gugure! Kokkuri-san is a 'good' anime where the term 'good' surely requires a lot of explanation. For while I enjoyed it to some extent, I won't be extremely eager to recommend it to someone else. Let me explain. Unlike some animes that might not mess up in various ways but their positives are not so appealing either to get them a 9 or 10, Kokkuri san has both positives and negatives. Plot wise, there isn't much except the appearance of the different ghostly characters in the anime and how interact with Kohina - the protagonist of sorts around which the entire story revolves. Thus it is an episodic anime, other than the characters popping at intervals, there is no bigger plot. And honestly the plot here doesn't matter as much as the characters and the entertainment they give. However there are certain themes tackled in separate episodes that are well developed and rather appealing to watch. They can be given credit. The art is good - the scenery's are nice, colorful, the anime gives off a happy vibe to it and most of the characters are also drawn well. And the music was good - it was complimenting, setting the mood and over all I was fond of it. The real critique starts here: As with episodic animes, the entire anime boils down to the enjoyment. Did you enjoy it? Did the previous episode make you want to watch the next? And the entertainment in such episodes depends greatly on the characters. How did THEY tackle the episode. It isn't a matter of plot - they could be going to a theme park or beach, or cleaning the house, but how they manage to execute it - and since this is a comedy anime, how many laughs did we get out of it. Keeping in mind those criteria, the two characters that are introduced since the start of the anime (and I consider those two as the 'main' characters since one is Kohina - the girl around which the anime revolves and the other is the one after whom the anime is named), Kokkuri-san and Kohina are first to be discussed. And these two strike off very well together. Kohina - a girl self believing she is a doll who goes off with philosophical monologues that even depress the aged spirit and the aged spirit (that doesn't look aged) that despite craving to be feared finds the unstable state of Kohina too pitiful to leave her alone. She depresses him, he gets over it, she eats cup noodles, he disposes off them. She and he... they just develop a chemistry that compliment each other very well. Her retorts and his retorts work well with giving the viewer good, light, family comedy. However when the rest of the spirits start pouring in, the anime turned from very good to mediocre. The characters are also in one way or the other attached to Kohina (except Shigaraki who is just there for fun - but he too is perverted) but their attachment is forced. Now that in itself doesn't seem like a bad trait, the show is comedy, there is no reason to stick to extremely believable progression as long as we get comedy right? But that is where the show loses appeal. The punch lines/events associated with the other characters all seem forced in contract to Kokkuri-san and they just don't hit the nail. And you see them trying to be funny but they just can't get it right mot of the time. At times, yea - they manage to get a comical flurry - but rarely. Furthermore, they made the rest of the characters way too 1-Dimensional to like. Yes, Kokkuri-san is no Kurono from Gantz either - he isn't the best example of a 3-D char but his traits shown are not excessively questionable - or you don't find the reason to question them. For the rest of the characters, they just seemed like medicore fillers in a decent anime. And when the fillers are there for more than half of the anime - it gets boring. True, there are certain comical moments combining all the chars but the expectations given by the duo in the start did leave me a little disappointed till the end. So, if you are looking for a decent, light comedy anime that you can watch with someone who doesn't have a very specific taste, then it is a good choice. However, if you are looking for a really good attempt at comedy that definitely delivers epic fun, then sorry - it has its moments, but I won't recommend it to you on those basis. Thank you reading and whether you agree or not, I am glad to discuss so any constructive feedback or discussion is welcome!